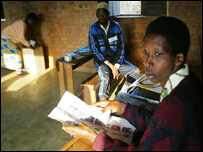 African newspapers have mixed feelings about the outcome of Rwanda's first democratic election since the 1994 genocide. While none doubt the legitimacy of President Paul Kagame's victory, several question the conduct of the polls and the margin of his win. Others see the elections as a turning point for Rwanda and urge Mr Kagame to seize the opportunity to foster genuine national unity. "Paul Kagame's sweeping victory in the Rwanda election is both cause for celebration and commiseration," says Kenya's The People in a comment typical of much of the reaction. "Whilst we applaud the people of Rwanda for their magnificent resolve in putting their haunting past behind them and turning out in great numbers to exercise their civic duty, it is a pity that the electoral system they had to participate in was nothing short of a farce," it adds. 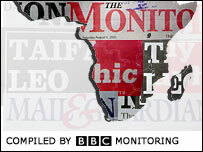 Charges of vote-rigging and harassment of the opposition are highlighted by several papers. When I voted for Twagiramungu, an official grabbed the ballot and told me not to waste his time and vote again. Nigeria's The Vanguard notes that the campaign was "marred by allegations of government-sponsored intimidation of opposition supporters", while South Africa's Guardian quotes voters in opposition candidate Faustin Twagiramungu's hometown of Cyangugu as saying they had come under pressure to vote for the incumbent. "When I voted for Twagiramungu, an official grabbed the ballot and told me not to waste his time and vote again. 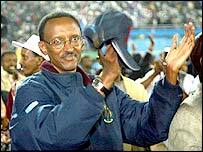 When I voted again for Kagame they accepted it," one man complains. "Today is a catastrophe: people forced to vote for Kagame, people afraid of being imprisoned if they don't. I voted for Twagiramungu but whether my vote will be counted, I don't know," laments another. An article on South Africa's Mail & Guardian web site warns that Mr Kagame's "thumping victory" could backfire. "It's too much. It looks like the return of single-party rule," the report quotes a regional human rights activist as saying. "If I were he, I'd have done it differently, for the sake of my own credibility," another analyst comments. In the words of The Cape Times: "The overwhelming margin of victory raised eyebrows." The People draws a parallel with the situation in Nigeria. "Like his Nigerian counterpart Olusegun Obasanjo, who marred certain electoral victory with blatant polling mischief, Kagame's victory is likely to leave a sour taste in the mouth," the Kenyan daily says. "His 94% victory margin may be a reflection on his popularity... More plausibly, though, it could be a manifestation of a reluctant democrat. A man who craves the international recognition that comes with democratic election yet abhors the rigours and irritations that come with the territory." And a commentary in Uganda's The Monitor compares Mr Kagame to Ugandan President Yoweri Museveni, who has been in power for 17 years. "The one thing that is striking about the Rwandan elections," it comments, is "the increasing parallels between the Ugandan and Rwandan leaders." "Forget about the rows between Kampala and Kigali. On the art of politics (or is it staying in power? ), Kagame and Museveni attended the same tutorial." Other commentators are more upbeat. Several focus on the post-election celebrations. Le Soft, from the Democratic Republic of the Congo, for example, reports that "at least 80,000 people transformed the capital's main stadium into a giant nightclub, with groups of musicians making it dance until the early hours". Coverage in Nigeria's Vanguard includes a report from a school where 2,500 people sought UN protection shortly after the 1994 genocide began under the headline, "Rwandans exorcize ghosts of genocide by voting at site of massacre". It quotes locals as saying that the decision to use the school as a polling station symbolizes Rwanda's "desire for healing". Uganda's New Vision hails the election as "a major step in the democratization process". "The losers," it adds, "need to accept the result with honour and the winner to mend the rifts that the polls might have caused." Kenya's East African sees the poll as an opportunity to usher in "a new era" in the Great Lakes region and "cement the trend towards more mature politics on the continent". And Kenya's Daily Nation argues that Mr Kagame has "joined an elite crop of African leaders who have successfully transformed themselves from junta leaders to claim a popular democratic mandate". The challenge is more than just telling Rwandans that they are Rwandans, not Hutus and Tutsis. "President Kagame must now employ the popular mandate to push forward peace and reconciliation," it adds. Kenya's Times is concerned about the impact of the result on the Hutu community. "Although yesterday's vote has been billed as a showcase for how far Rwanda has come in the nine years... the failure of Kagame's main rival, Faustin Twagiramungu, a Hutu, to perform credibly, may be a big blow to the majority Hutus," it says. And an analysis in The New Vision headlined "Tutsi-Hutu factor still dogs Rwanda politics" also dwells on the ethnic issue. "The challenge for the winner," it concludes, "is to build national unity on the foundation of mutual respect and confidence." 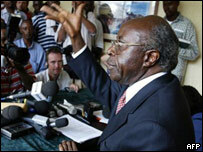 "The challenge is more than just telling Rwandans that they are Rwandans, not Hutus and Tutsis. The challenge calls for openness in all spheres of national life, particularly political openness." "The celebrations started long before the first official results"